For the last five months Spacing has been investigating the political maneuvering behind the decision to build the Scarborough subway. This is the timeline that supports the 5-part series. During the debate on the wording of the report request, de Baeremaeker tries to move a motion asking that staff report on the “merits” of a Scarborough subway extension. Council speaker Frances Nunziata rules the motion out of order as “it is a reconsideration of a previous Council decision.” De Baeremaeker challenges the ruling and loses, 26-14, with the brothers Ford supporting Nunziata. Tory leader Tim Hudak holds a “campaign-style” presser at City Hall, pledging that a Progressive Conservative government “will build underground.” According to The Globe and Mail, de Baeremaeker backed Hudak’s statement, but Stintz did not, saying council has signed on to the four LRT projects, including the one planned to replaced the SRT: “As far as I am concerned, those deals have been done, those lines have been confirmed. That is the expressed will of city council,” said Ms. Stintz. “We need to build transit in this city. We can’t spend more time debating the decisions that have already been made,” she said. On a surprise motion by de Baeremaeker and Milczyn, the Toronto Transit Commission board votes to ask staff to study the “feasibility of converting the Scarborough RT to a subway — instead of the currently-approved light rail — from Kennedy Station, north through the Scarborough Town Centre, continuing on to Sheppard and McCowan, and the further extension of such a subway from Sheppard and McCowan to Sheppard and Don Mills.” Commission member John Parker dismisses the motion as a “stupid, stupid” move. 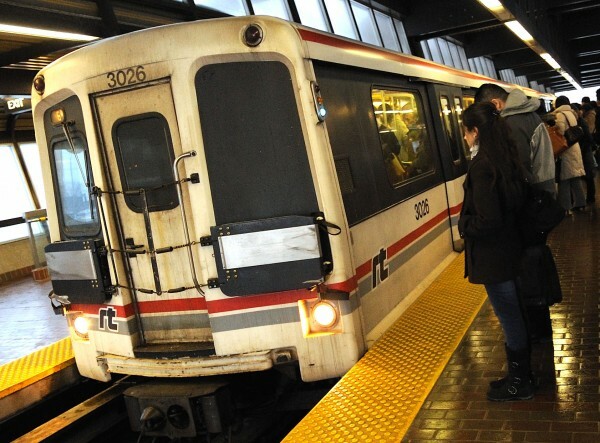 According to The Toronto Star, a new Forum Research poll shows that 61% of respondents agreed that a downtown subway, running from around Pape Station down along King St. to University Ave., was “a more pressing need for transit in Toronto” than a Scarborough subway. After several weeks of wrangling over the fine print, Metrolinx, the Toronto Transit Commission and the TTC sign a master agreement [PDF] laying out the terms and conditions for the construction and operation for the four LRT projects, including the conversion of the Scarborough RT. At a press conference, Metrolinx CEO Bruce McCuaig described the agreement as more binding than the memorandum of understanding that Ford killed upon taking office. “It is a true contract,” he told The Star’s Tess Kalinowski, adding that there are no guarantees. In-coming premier Kathleen Wynne appoints a new cabinet, including leadership campaign supporter Glen Murray as minister of transportation and infrastructure. She demotes Scarborough-Guildwood MPP Margarett Best, Dalton McGuinty’s consumer affairs minister, from her portfolio. Best skips the swearing-in ceremony. Kathleen Wynne, scarcely two months into the premiership, shoots down discussion of a rethink of the major transit projects approved in November. According to The Toronto Sun, “Wynne said she’s `determined to move forward’ on transit construction in Toronto, burying any prospect that Queen’s Park would be willing to revisit the agreement to build four LRT lines — including the Sheppard LRT — across the city. “I have been very clear that we’ll be working with Toronto council, we’ll be working with the city council and I know that we’ll land on the best plan for the city,” Wynne said. John Tory, in a speech to the Empire Club, comes out in favour of upgrading the Scarborough LRT project to a subway. According to The Globe and Mail, a group of councillors — including Stintz, de Baeremaeker, Michelle Berardinetti, Josh Colle and Joe Mihevc — will be attempting to get a motion to formally consider the plan before council, with the decision linked to funding from the province. A quid pro quo begins to emerge, reports The Globe and Mail: “The subway question may come down to the city’s willingness to buy into the province’s proposal for dedicated revenue tools – possibly taxes, tolls or fees – to build public transit, Queen’s Park and city hall sources said.” But Metrolinx officials say that switching plans at this point will be difficult and expensive, although the exact amount seems unclear. City/TTC sources put the figure at $500 million. During a long and strange debate over the revenue tools council would support to build transit, de Baeremaeker moves “that City Council support the extension of the Bloor Danforth Subway Line from Kennedy Station to the Scarborough Town Centre and north to Sheppard Avenue.” Despite the fact that council is debating a report about transit funding, and has not been presented with any formal assessment of the cost of a Scarborough subway project, council speaker Frances Nunziata rules that the motion “does not require a re-opening and is properly before Council.” De Baeremaeker’s motion passes 35 to 9. Citing health concerns, Scarborough-Guildwood MPP Margarett Best resigns, paving the way for a by-election in the riding where the subway would run [correction: the proposed route will not pass through Scarborough-Guildwood]. Metrolinx CEO Bruce McCuaig releases a letter [PDF] to city manager Joe Pennachetti, threatening to down tools on the Scarborough LRT unless city council clarifies its position on the subway upgrade proposal by August 2. Stintz says she was “caught off guard” by the province’s ultimatum, according to The Toronto Star. The Liberals nominated Civic Action CEO Mitzie Hunter to be the candidate in a Scarborough Guildwood by-election, which, according to Inside Toronto, is expected to be called by Wynne for the following day, to be held August 2, the day of the Metrolinx deadline. Civic Action had lobbied for revenue tools for transit investment. Hunter was also a member of an expert panel, led by Prof. Eric Miller, which advised council to stick with the LRT plan in the spring of 2012. As she told The National Post at the time, “The LRT option is the choice for the ridership, for the funds that are available, and also for timeframe in terms of the impact on the community and for equity issues as well – bringing rapid transit to more people,” she said. In a report on funding [PDF], Pennachetti says the project could be financed with a 1.1-2.4% tax hike, depending on whether the province re-allocates the entire $1.8 billion earmarked for the Scarborough LRT. Ford says he’ll back a .25% tax hike, wants the feds to ante up and (briefly) raises the possibility of re-allocating Ottawa’s $330 million contribution to the Sheppard East LRT. By a 28-16 vote, council approves the $2.3 billion Scarborough subway plan (7.6 km, 3 stops), contingent on the province re-directing $1.8 billion from the LRT project and the feds funding 50% of the shortfall after factoring in a 1.1% property tax hike. The pro-subway contingent includes perhaps unexpected supporters Joe Mihevc, Paula Fletcher, Mary-Margaret McMahon, and Paul Ainslie — all aligned previously with the pro-LRT faction on council. Mitzie Hunter wins Scarborough Guildwood for the Liberals after a campaign in which the subway turned out to be a ballot question. Even NDP candidate Adam Giambrone, one of the architects of the Transit City LRT strategy, hedged extensively on the campaign trail. On the same day, Metrolinx informs the City that work on the Scarborough LRT has officially stopped. Standing on the roof of a parking garage Murray unveils his own Scarborough subway plan, a 6.4 km/2 stop extension that would stop at Scarborough Town Centre instead of continuing up to Sheppard Avenue, as the city wants. The provincial contribution: $1.4 billion. Murray’s freelance plan triggers a wave of hand-wringing and intense criticism from council. The National Post reports that Metrolinx chair Rob Prichard describes the subway plan as “the best of both worlds,” but warns that council has to officially negotiate changes of the Metrolinx master agreement before it can proceed. The city formally requests the federal government to contribute $660 million to the project in advance of a late-September “deadline” to secure funds. Finance minister Jim Flaherty pledges $660 million to the city’s three-stop subway (to Sheppard East). “You have our money, now let’s get this subway built,” he told reporters. According to The Toronto Sun’s Christina Blizzard, the feds’ move “assures” Ford’s re-election. By a vote of 24-20, council confirms the Scarborough subway plan, and the proposed tax increase, which will last for 30 years and cost the average homeowner about $41 annually. Besides Stintz and Ford loyalist Cesar Palacio, the only downtown councilor still on the “yes” side is Ana Bailao; Mihevc, Fletcher, McMahon and Ainslie, who all supported the July subway vote, backed away. Part 4: Won’t somebody think of Bombardier? Neither the author nor Spacing necessarily agrees with posted comments. Spacing reserves the right to edit or delete comments entirely. See our Comment Policy. Correction: “a by-election in the riding where the subway would run”. Scarborough Guildwood riding is entirely east of Bellamy and is not directly served by either the existing SRT nor by the proposed subway under McCowan (which is 1km west of Bellamy). I’m still surprised no-one has asked for a judicial review of the council decision to switch from LRT to subway, which should have required a 2/3 majority to get on the agenda (according to the procedural bylaw, revisiting a decision within one year requires such a vote). Great series…And a pathetic group of politicians. Only problem is your link to Council’s final vote is broken. I’d like to know who else supported this fiscal fiasco, to ensure they don’t get my vote in October.